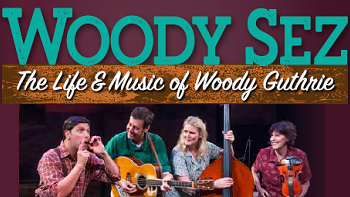 Tap your feet and sing along with Woody Guthrie, America’s greatest troubadour, in this joyous musical portrait. You will be transported through his fascinating life with moving ballads and energetic foot-stompers like “This Land is Your Land,” “The Ballad of Tom Joad,” and “This Train is Bound for Glory” in this incredible musical journey. The Rock and Roll Hall of Fame calls Woody Guthrie "the original folk hero; a man who, in the Thirties and Forties, transformed the folk ballad into a vehicle for social protest and observation and in so doing, paved the way for Bob Dylan, Bruce Springsteen and a host of other folk and rock songwriters who have been moved by conscience to share experiences and voice opinions in a forthright manner. Fueled by a boundless curiosity about the world, the colorful life he led became as legendary as the songs he wrote.